Art Clay paper is one of the most versatile yet under-utilized forms of metal clay: it can be punched, embossed, cut, folded, and more! Once fired, the pieces are pure silver. 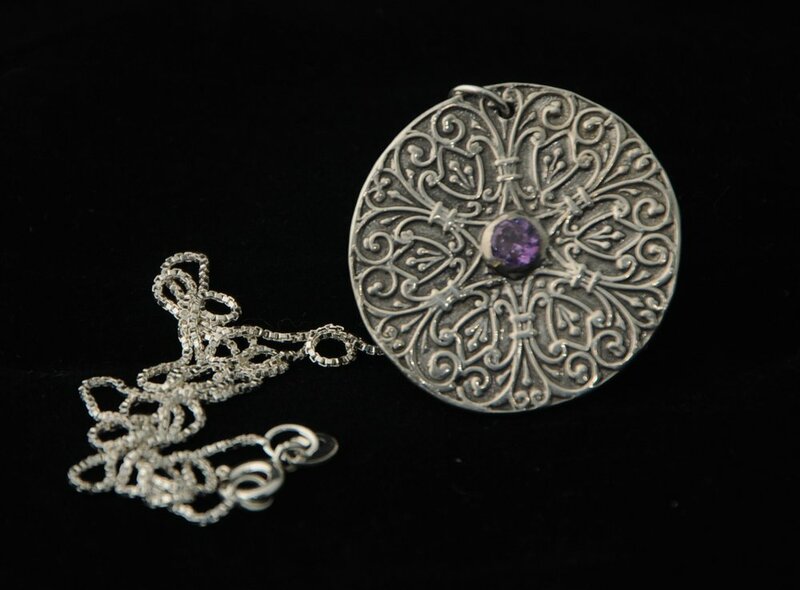 Students will explore several applications for paper-type clay and create stunning, unique fine-silver jewelry. Discover the potential of paper! Learn proper techniques for using paper-type metal clay with a special focus on quilling, and using paper punches to create stunning jewelry; how to combine paper-type metal clay with other types of Art Clay Silver; how to fire the pieces. Use real leaves to create a one-of-a-kind pendant out of pure silver. Finish your unique design with a stunning gemstone and twisted stem bail to create a gorgeous and elegant, lasting piece of nature. The piece will be completed in class but fired and polished after class is over. Students can pick up the finished pieces the next day. Learn basic metal clay techniques including working with the clay, sanding, and finishing; how to create a clay gemstone bezel for a CZ; how to design a coil bail. Explore the ancient art of Kumihimo, a Japanese braiding technique. You will learn the traditional round braid using 8 cords. Once you learn the pattern you can add various colors, use cords made from satin or silk, or even add beads. You will leave with a finished necklace and knowledge to make more kumihimo jewelry! Learn how to use metal clay to jewelry from pure copper. This is a flexible medium that can be rolled, stamped, cut and manipulated like traditional clay. Finished pieces are kiln or torch-fired to become almost pure copper. Copper employs the same techniques as silver metal clay but is a less expensive alternative. Learn basic metal clay techniques including how to work with the clay, sand it, and add texture. Class fee includes supplies and materials for all 4 class sessions. 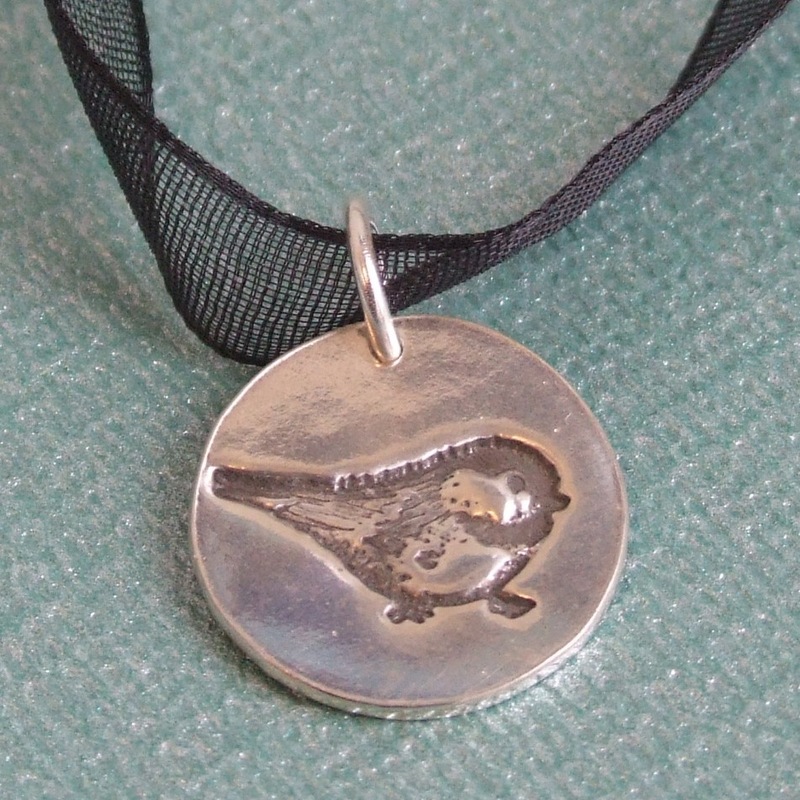 Learn how to make silver jewelry without saws or power tools by using metal clay. This flexible medium can be rolled, stamped, cut, and manipulated like traditional clay. Finished pieces are kiln or torch-fired to become 99.9% pure silver. Each week, students will learn and apply new techniques for working with metal clay and create a variety of unique jewelry designs. All tools provided. Class fee includes materials for first class. Enamel is a fun way to add a dramatic element to jewelry, and fine silver provides the perfect surface for enameling. In this class students will learn three enamel techniques for fine silver metal clay: basse-taille, champlevé and faux cloisonné using syringe clay. Students will learn how to create pieces in Art Clay silver appropriate for each enamel method. All enamel will be torch fired. Registration fee includes 20g of Art Clay Silver, and shared use of Art Clay syringe and enamel resources. All other supplies will be provided. Participate in a make-and-take collection of classes at the MN Landscape Arboretum! Choose 3 of 4 potential projects and end the day with a present for everyone on your holiday list. In my session, students will have the opportunity to create a garden-inspired mosaic necklace + earrings set using seed beads and crystal clay. Crystal Clay is an easy to use, versatile medium with many jewelry applications. $99 member/$119 non-member. Includes Arboretum admission, all class supplies, and lunch. Learn multiple ways to set gemstones in metal clay. 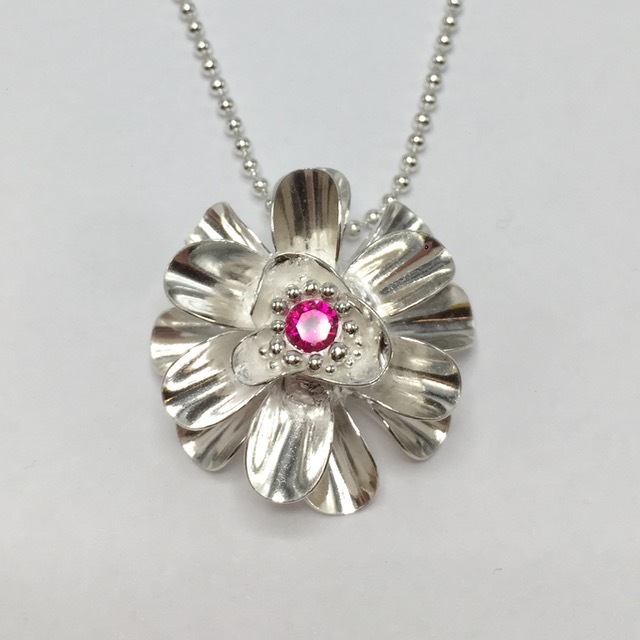 Unlike traditional silver work, no soldering or power tools are required! Stones can be set easily into the clay and fired into place to create stunning jewelry. Students will learn basic metal clay skills as well as stone setting techniques. Perfect for beginner or experienced metal clay artists. All tools provided. Class fee includes materials for the first class. Learn how to use metal clay to jewelry from pure copper. This is a flexible medium that can be rolled, stamped, cut and manipulated like traditional clay. Finished pieces are kiln or torch-fired to become almost pure copper. Copper employs the same techniques as silver metal clay but is a less expensive alternative. Learn basic metal clay techniques including how to work with the clay, sand it, and add texture. Items will be fired after class and available for pick up at Alchemy Arts. This class will introduce you to the truly amazing craft of Metal Clay. Discover how to incorporate gems into your metal clay designs to create truly brilliant jewelry out of pure silver. Items will be fired after class and available for pick up at Alchemy Arts. Learn three enamel techniques for fine silver metal clay: basse-taille, champlevé and cloisonné using syringe clay. Students will learn how to create pieces in Art Clay silver appropriate for each enamel method. All pieces and enamel will be torch fired. All other supplies will be provided. Supply fee of $65 includes 20g of Art Clay Silver, and shared use of Art Clay syringe and enamel resources. Learn several ways to add color to copper clay, from colored pencil to patina inks. Students will design pieces in copper clay and, after firing, enhance the design with various coloring techniques. Copper clay basics will be covered in this class; no previous copper clay experience is needed. Copper clay is an inexpensive and easy way to create pure copper jewelry without saws or power tools. All supplies will be provided. Students are welcome to purchase additional metal clay packets from the instructor. The supply fee of $50 includes 50 grams of Art Clay Copper and metal clay tool kit. Students who have a metal clay kit will receive 2-50g packets of Art Clay Copper. In this class we will start by making reusable silicone molds using vintage buttons which we will then use to create silver charms for pendants, earrings, or bracelets. Learn the techniques for how to work with metal clay, how to embed jump rings for a more polished look, and how to set gemstones in your design. Enamel is a fun way to add a dramatic element to jewelry, and fine silver is the perfect surface for enameling. In this class students will create metal clay pieces with cells to be filled with enamels. They will torch fire the enamel layers to create stunning jewelry components to turn into earrings, bracelets, or necklaces. Students will Learn: Basic metal clay techniques including working with the clay, sanding, and finishing. How to prep, wet pack, and torch fire enamels. This stunning bracelet is made using silicone molds of nature-themed vintage buttons. Learn how to use Art Clay Silver to create your silver charms and attach them together in a bracelet you'll be proud to wear. Class fee includes 20 g of Art Clay Silver, gemstones, embeddable jump rings, silicone mold material, firing, and finding (jump rings and clasp). Items will be fired by the instructor after class and made available for pick up at the District Program Center in Cottage Grove one week after the class date. To usher in the spectacular summer exhibition "Origami in the Garden" at the MN Arboretum try your hand at creating your own wearable origami art! Students will learn the folding techniques using origami and chiyogami paper and finish the project with a protective spray to make the designs more durable. Wear these beautiful one-of-a-kind earrings or give as gifts (Mother's Day is right around the corner). All materials included. Learn how to incorporate dichroic glass into metal clay designs! Dichroic glass reflects multiple colors when viewed for a magnificently vibrant effect. Enough clay will be provided to create a pendant and earrings set or several pendants. Students will use stamps and various textures to create a base design to embellish with their choice of dichroic cabochon. No experience is necessary and all supplies will be included. Use real leaves to create a leaf pendant using pure silver. Learn basic metal clay techniques including how to work with the clay, sand it, and create your design. Class fee includes the cost of 15g of Art Clay Silver and ACS Paste, gemstones, firing, and findings. Items will be fired by the instructor after class and made available for pick up at the District Program Center in Cottage Grove one week after the class date. Learn how to use metal clay to create a flower pendant and earrings from pure copper. This is a flexible medium that can be rolled, stamped, cut and manipulated like traditional clay. Finished pieces are kiln or torch-fired to become almost pure copper. Copper employs the same techniques as silver metal clay but is a less expensive alternative. Learn basic metal clay techniques including how to work with the clay, sand it, and add texture. Class fee includes 25g of Art Clay Copper, firing, findings, and use of tools. Items will be fired by the instructor after class and made available for pick up at the District Program Center in Cottage Grove one week after the class date. Learn multiple ways to set gemstones in metal clay. 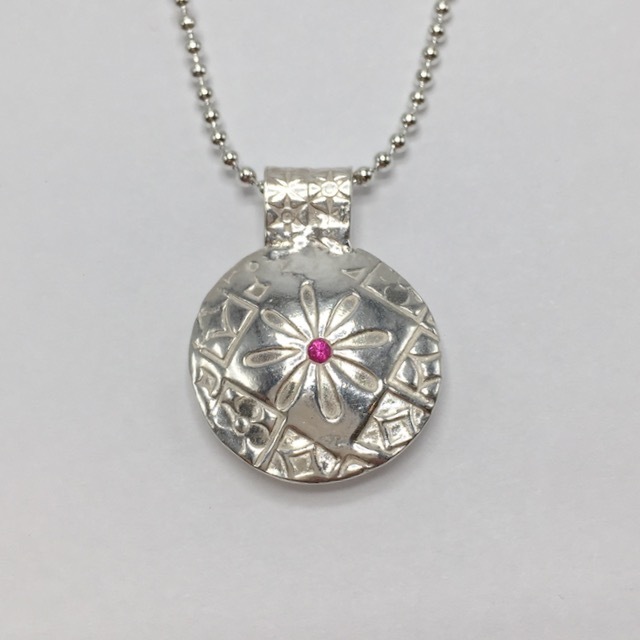 Unlike traditional silver work, no soldering or power tools are required -- stones can be set easily into the clay and fired into place to create stunning jewelry. Basic metal clay skills as well as stone-setting techniques. Perfect for beginner or experienced metal clay artists. Lentil beads are a cornerstone of metal clay jewelry design. Learn how to construct a basic bead, then add variations to create more complex, interesting designs. Each week students will learn a new skill to incorporate into their lentil bead jewelry. Students can use these skills to design their own custom earrings, necklaces, and charms. Metal clay is a form of silver that can be manipulated like traditional clay and, once fired, become 99.9% pure silver. Learn how to use metal clay: a flexible medium that can be rolled, stamped, cut and manipulated like traditional clay. Finished pieces are kiln- or torch-fired to become 99.9 percent pure silver. Each week, students will learn new tips and tricks for working with metal clay. Students will apply those techniques to create a variety of finished pieces of their own design. All supplies will be provided. Students are welcome to purchase additional metal clay packets from the instructor. The supply fee includes two 10-gram Art Clay Silver packets. A great holiday gift or to make for yourself...create a stunning pure silver snowflake that will outlast the cold! In this class you will design snowflake-inspired jewelry in metal clay. Students will learn how to set gemstones to add a little extra sparkle and shine to their pieces. Enough clay will be provided to create a pendant and earrings set or several pendants. No experience is necessary and all supplies will be included. Create amazing jewelry using Art Clay Silver paper type. This is a flexible medium that can be folded, cut, and embossed like paper, but once fired becomes 99.9% pure silver. 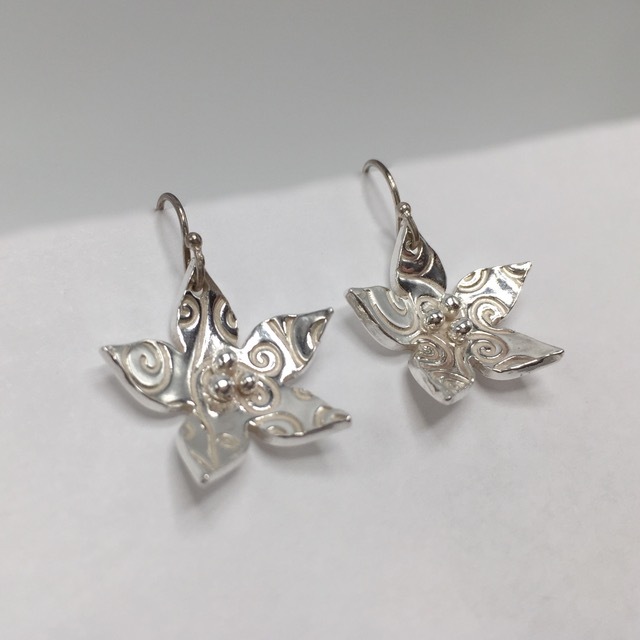 In this 6-week class students will learn to create 2 origami pieces in silver (butterfly and crane), complete a quilled design, make a stunning flower pendant, and several other projects. In addition students will have time to work on their own projects using the techniques learned. All supplies provided. Learn how to use copper metal clay: a flexible medium that can be rolled, stamped, cut and manipulated like traditional clay. Finished pieces are kiln or torch-fired to become almost pure copper. Copper employs the same techniques as silver metal clay but is a less expensive alternative. All supplies will be provided. Kumi himo is Japanese for "gathered threads," and is descriptive of a historic Japanese braiding technique. Kumihimo cords were used by samurai on their armor, and are now used to secure haori jackets and kimono sashes. Immerse yourself in this traditional and centuries old method to create a statement bracelet. Students will learn how to incorporate beads into the traditional 8 warp round braid. Once you are comfortable with the steps you will be able to create bracelets and necklaces in a wide variety of patterns and designs. You will leave with a finished bracelet and knowledge to make more kumihimo jewelry!